A year ago Sony released what I'd argue is the best game of the last generation, The Last of Us for the PlayStation 3. Since its release, rumors have been flying as to whether or not Naughty Dog would bring the game to the PlayStation 4. Luckily for us, those rumors were true in the form of The Last of Us Remastered. For those not in the loop, The Last of Us is the tale of Joel and Ellie. These characters are easily connected with from the very beginning and gain a deeper understanding of them as the game goes on. Similar to Cormac McCarthy's novel “The Road”, there are many moments where the two do nothing but walk around while discussing their past and future. These simple moments not only make you root for them, but also make you truly care about what’s happening to them. The game goes out of its way not to have every conversation push the story forward but instead, offer a glimpse inside their minds. It doesn’t shy away from slow moments where no action takes place, allowing you to dive a little deeper into these two characters. I'm happy to report that The Last of Us Remastered still plays to near perfection. It takes some of the best elements of Uncharted (gun play and movement) and adds in intelligent AI with brutal hand-to-hand combat. The Last of Us Remastered does a good job keeping things from getting stale by mixing up both human enemies and the walking dead. Humans are a straightforward enemy while the undead can be quite a challenge. The game gives you the freedom of choosing whether to attack straight on, or take a more stealthy approach. Naughty Dog has added some nice touches to the game that even help the experience. For one, you get to use the Dual Shock 4 controller which is a much better fit for this game. Naughty Dog also has implemented the controller's speaker to adds a wonderful, spine tingling feel to the experience. They even use the light bar on the Dual Shock 4 to show your health (green, yellow, red) but the effect is hard to notice if your room is not pitch black. What makes combat even more intense is the scarcity of both weapons and time. For 75% of the game you will only have a handful of bullets, a melee weapon (if you’re lucky) and supplies to create weapons like smoke bombs, or adding scissors to a melee weapon. The weapon creation system happens in real time so if enemies are on to you, you won’t have the chance to craft a weapon and instead have to find different ways to take them out. This adds to the already high sense of terror that The Last of Us cultivates so well. The combat is also extremely brutal. There is an uncomfortable crunch that happens anytime you bash someone or something in the head with a bat. If you have a good 5.1 Surround Sound setup, be prepared to have more than a few startles. The Last of Us main campaign comes in around 15 hours or so. Very rarely do I ever go back and re-play games but I knew right when they announced The Last of Us Remastered that I'd definitely be up for another play through. And in fact I think I got an even greater appreciation the second time through. Not only do I still think the combat is great but the games story-arch is unparalleled. It's one of the most incredible achievements in the last generation. Add on top of that the inclusion of The Last of Us: Left Behind which is just as good and you've got quite the package deal. You may be surprised to learn that The Last of Us Remastered also houses a multiplayer mode that includes all DLC released for the PS3 version. You pick a faction (Fireflies or hunters) and you have two modes to choose from: Supply Raid (team deathmatch) and Survivor (only allows you to die once). What I found most intriguing about my time in multiplayer was that not only do story elements pop up, but that the mode doesn’t make you feel too far removed from the core single player experience. Its quite impressive that Naughty Dog was able to put in such a stellar multiplayer mode while not compromising its core experience. The fact that the single player and multiplayer actually mesh is incredibly refreshing. It continues to drive home the point of how much thought went into every little piece of this game. It’s the type of experience that doesn’t come around every day. It’s easy to see that the developers probably spent weeks working on the most small and minute details. Just spend a few minutes reading some of the letters that are left behind on the journey and you will see that no stone was left unturned to make the experience feel authentic. 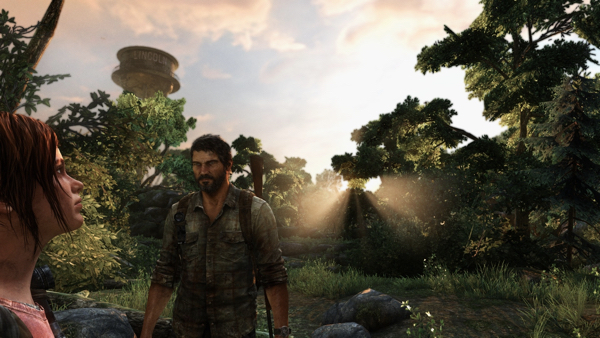 The Last of Us Remastered does include visual upgrades. Bringing the game to the PlayStation 4 allowed Naughty Dog to present the game in full 1080p, 60 frames per second with even greater detail. The game was already stunning and is even more so on the new console. I caught myself at least a dozen times just putting the controller down and marveling at the beautiful visuals. There is even more detail now on the character models. To be perfectly frank this might be the best looking PlayStation 4 game available today. It's stunning. The Last of Us is a masterful tale of two individuals who are both authentic and flawed. It creates one of the most memorable video game experiences I have ever played and I believe its the best game to come out in the last ten years. The Last of Us Remastered packages that came along with its equally incredible single player DLC Left Behind and a wealth of multiplayer DLC made for an amazing packaged deal. Even if you've played The Last of Us, owning one of the best games of the last ten years in all its 1080p glory is worth the price of admission. The Last of Us is a masterful tale of two individuals who are both authentic and flawed. It creates one of the most memorable video game experiences I have ever played and I believe its the best game to come out in the last ten years. Child of Light is one of the most enjoyable and beautiful games I’ve played so far in 2014. It’s bursting with charm and had me grinning from ear to ear for its ten hour story. My only hope is this isn’t the last we see of Aurora and this beautiful world. If you haven't yet gone on the Child of Light journey I implore you to stop reading now and go play this game. For $15 your not going to find a better value all year. In the end MLB 14: The Show is an excellent game of baseball, and is made even better on the Playstation 4. The game is drop dead gorgeous and comes in as one of the best looking sports games on the market to-date. Combine that with arguably one of the deepest sports experiences and this comes in as just an all-around incredible baseball experience that shouldn't be missed. Left Behind is a symbolic statement in as many ways as it is a physical one. It highlights Ellie Unsure and Ellie Triumphant, show us darkness while giving us hope with the smallest shafts of light. It is loss, heartbreak, harrowing sadness, but more then anything, it's a deeper look at a character that refuses to leave herself behind, no matter what hardships lie in front of her. Left Behind is how story DLC should be done. When I think about Uncharted 4: A Thief’s End, I can say that it’s in a class of its own. It's the most fun I've had with a video game since Super Mario World.